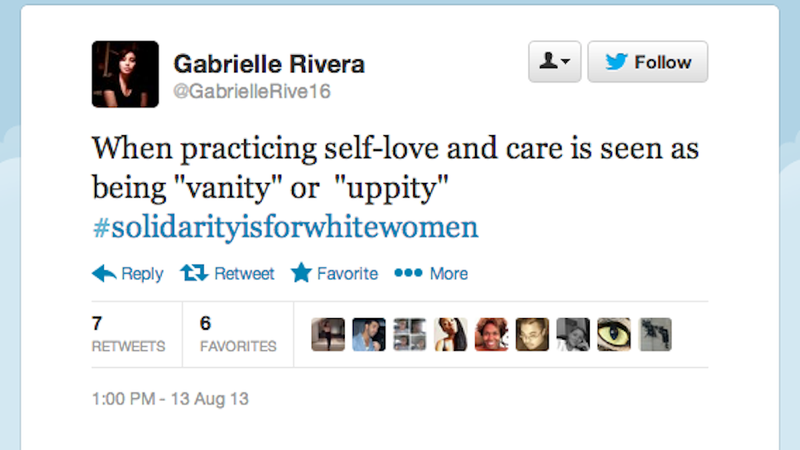 Yesterday, the hashtag #SolidarityIsForWhiteWomen trended globally on Twitter. But what's THAT mean? Media outlets that produce content specifically for women (and feminist media sources AHEM) have a terrible record of excluding women of color in the conversation, or refusing to address glaring problems with how women of color are presented or discussed by mainstream media outlets. There were literally thousands and thousands of Tweets on this subject yesterday, so if you've got some time to get schooled pretty hard, I'd recommend checking out the hashtag page. In the meantime, have a seat and strap in.